Phosphorus When You Need It! Mineral Development Fertilizer, soft rock fertilizer supplier, is an OMRI certified leader in organic fertilizer. MDF Mineral Grow is a calphos soft rock phosphate, also commonly called colloidal soft rock phosphate, organic fertilizer that provides a long-term approach to amending soil for phosphates. This high-phosphate, low-cadmium organic fertilizer offers immediately available phosphorus as well as a steady, constant supply of residual phosphorus over a number of years verses the typical approach of a single application of the acid phosphates. In many crops, the majority of the initial chemical phosphate application is unavailable when it is needed most, but this is not the case with MDF Mineral Grow colloidal phosphate. A key benefit to colloidal soft rock phosphate over the chemical phosphates is the colloidal component. This form of phosphate is available immediately, the phosphate, calcium, and trace elements are complexed into the clay colloid, therefore, they will never lock-up and they are also available for a time released period of 8 to 10 years, or as the plant needs them. MDF Mineral Grow is is a mineral-dense calphos fertilizer and is much more than just a phosphate source. Most significantly, It contains high levels of silica, which is another element that should be mentioned for all of its many positive benefits. MDF Mineral Grow adheres to and becomes part of the soil. It will not leach or revert, and once applied it remains in the soil until used by the plants making it safe to use in run-off areas. Meets the National Organic Program requirements for organic production. Processed phosphate fertilizers can contain high levels of the heavy metal cadmium. MDF Mineral Grow is an unprocessed phosphate and an ideal alternative for minimizing negative environmental impact such as run-off and health risks. It is environmentally beneficial in remineralizing soils and producing nutrient-dense crops. Research suggests increased brix levels in plants are related to the presence of silica. This phosphate source is in its completely natural state. Relatively insoluble, and therefore not subject to leaching. Offering growing plants a constant source of phosphorus and calcium that is capable of absorbing its own weight in water. Nutrient-dense soils produce better tasting products. MDF Mineral Grow is an environmentally beneficial, colloidal clay-based calcium soft rock phosphate that can never lock up, in contrast to other phosphate sources. 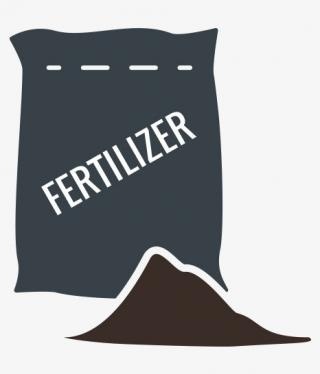 Our fertilizer contains 14.9% phosphorus, 18.5% calcium, a high analysis of silicon and an exceptional amount of other trace minerals. Click here for full specs. This bio-phosphate is microbe-friendly which is imperative for a healthy soil regeneration program producing the ideal nutrient-dense products. This phosphate source has no problem with high levels of heavy metals. Utilize the benefits of regular analyses soil testing. Ensuring your plants have complete nutrition through regular testing and subsequent tailoring of your inputs is the key to optimizing yield and quality. Contact MDF, the industry-leading colloidal phosphate fertilizer supplier, today for your professional soil consultation.